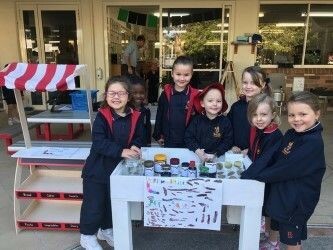 A wonderful thing has been happening at Pre-Prep since we introduced our worm farm last year. 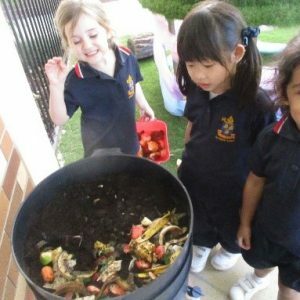 Every day the girls in Pre-Prep observe nature in action as worms help turn their daily food scraps into rich fertiliser. 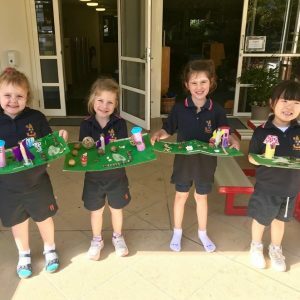 The girls have been embracing sustainable practices, but things have ramped up this year in Term 3.The worm farm is not the only way the girls actively participate in caring for the environment. We have been promoting sustainable practices through the setting-up of our compost bins and veggie patch. It’s been fabulous to see the girls engaging in the process. The compost bin is assisting us to reduce the waste that is not able to go in the worm farm and the materials and waste from the compost and worm farm is helping support our vegetable and herb gardens so we can continue to grow fresh produce to extend the girls’ learning experience. This has inspired us to start our “Worm Juice Sale”. 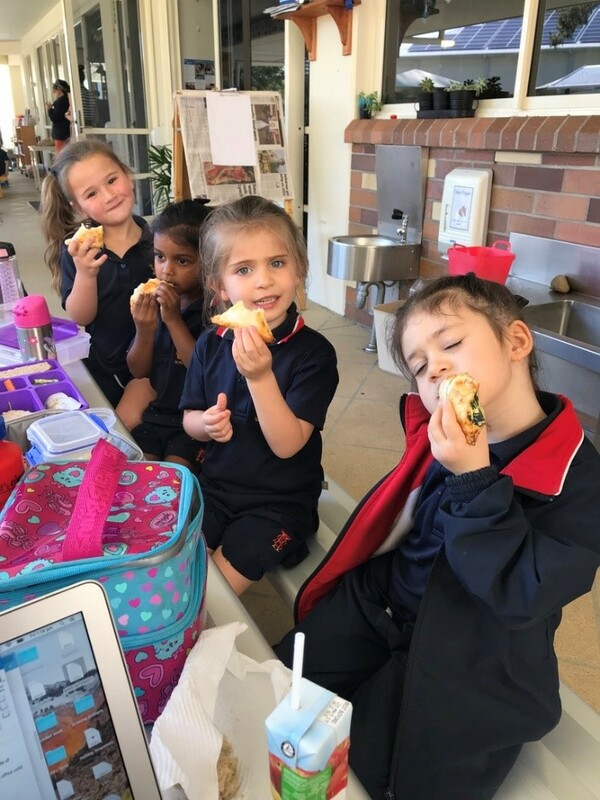 Our very first worm juice sale was on Thursday 2 August and it was a great success. We sold all 16 bottles of our “worm juice”. Thank you to all of the families who supported us to make a success of our sale. The next sale will be next Wednesday. 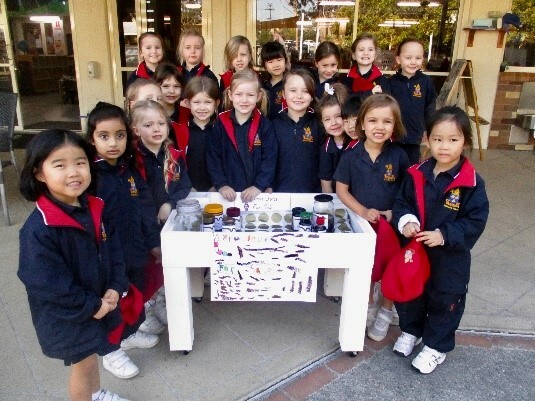 Please feel free to visit the girls’ sale station, which will be set up in the Pre-Prep outdoor area during drop off time between 8.00-9.00am and during pick up time 3.25-4.00pm. The “worm juice” is a concentrate and can be used as a fertiliser for your garden – it is a liquid supplement for plants. With all of the food scraps the girls use to feed the worms, the extra nutrients are returned to the soil and it is a great growth stimulant for your garden. It is also a sustainable way to eliminate waste, all for just a gold coin donation. 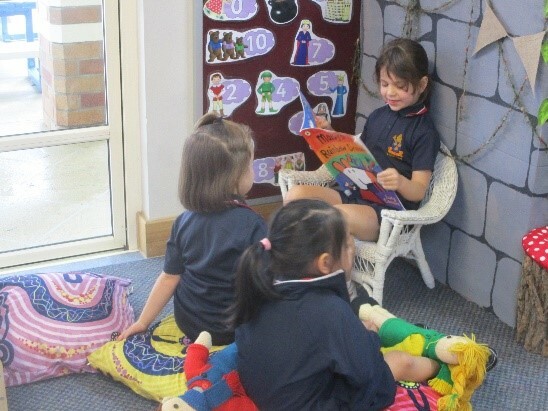 This week children in Pre-Preparatory have been participating in the Premier’s Reading Challenge. 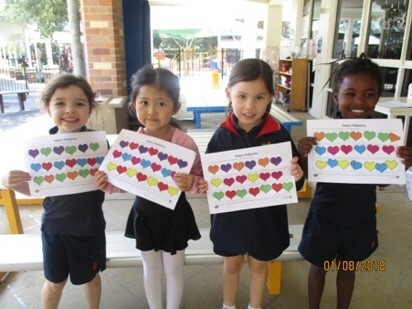 The Reading Challenge aims to encourage children to develop a love of reading for life. 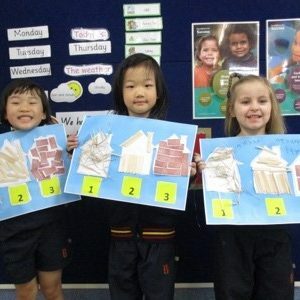 Research shows very young children involved in daily activities, such as reading, storytelling, singing and sharing rhymes will have better vocabulary, language and cognitive skills before they start school. Until August 24 Pre-Preparatory classes are totalling the number of book experiences shared during the day. Please take time to view the tally on the noticeboard in the Prep Undercroft. 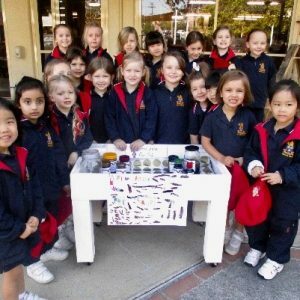 In September the Pre-Preparatory playground will undergo some refurbishments to add to the nature play opportunities of our girls. 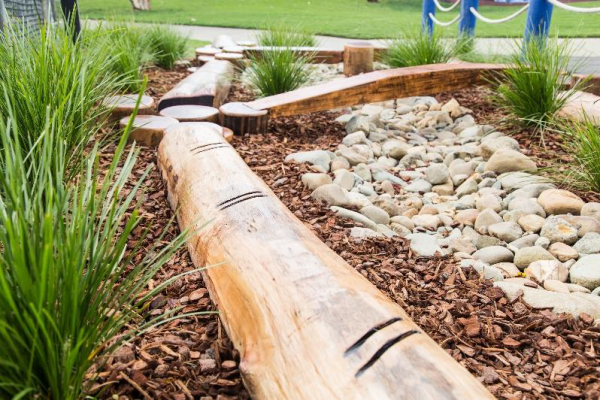 The area around the tunnel will see a dry creek bed with rocks, wooden bridges, yarning circle, plants, hand water pump and a wooden bridge overlaying the current tunnel feature. The aim of these refurbishments is to increase the opportunity for the children to engage in nature play in the playground and to provide appropriate opportunities for water play within the environment. Whilst the renovations are occurring, the area on the south-western side of the Pre-Prep playground will be fenced off to ensure the safety of our girls. Jingeri and welcome to Semester 2! 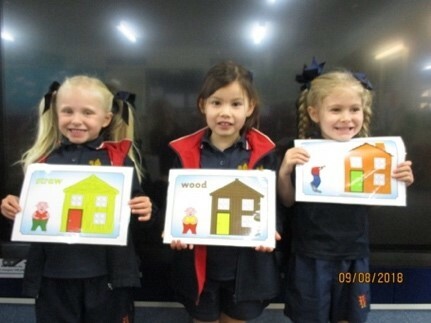 We have been very busy in Pre-Prep 1 this term discovering many new things. We have been investigating and learning about patterns after some of our class members displayed some misconceptions in this area. 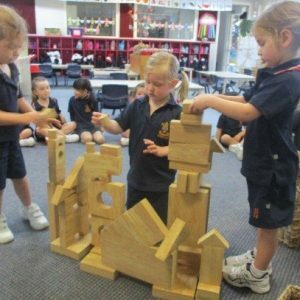 We have learnt that patterns can be made in many ways including with sound, our bodies and concrete materials. 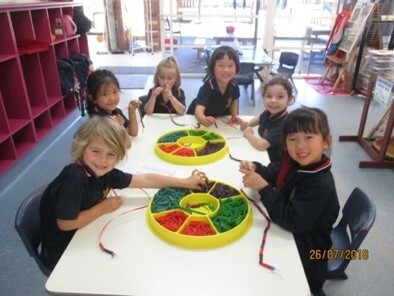 We have had lots of fun threading pasta necklaces, making patterns with musical instruments and manipulatives. The girls have displayed their ability to recreate, identify and create their own patterns. The ability to recognise and make predictions based on our observations is an important skill in math. Understanding patterns help prepare children for learning complex number concepts and mathematical operations. We have been following the girls’ interest in cooking and have made ice-cream, biscuits and jelly. Cooking allows the girls to use their numeracy skills as we follow a recipe, as we count, weigh and measure ingredients, and their science skills as they make predictions and observations and learn about physical science as items change form. We have been investigating and learning about ways we can look after our environment. The girls have learnt how to feed and care for the worms in our worm farm. We have even bottled and sold the worm juice. Thank you to the families who have purchased some. We are putting the proceeds towards buying more worms to enlarge our worm farm. 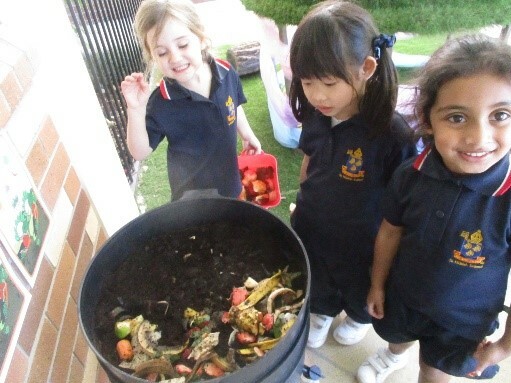 We have also learnt about composting and have been sorting and adding our scraps to the compost. The girls have been enjoying presenting their favourite book to the class and we have all been enjoying reading these stories. 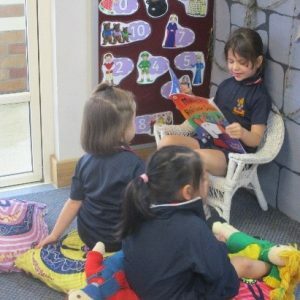 The girls’ book knowledge has grown and they have become familiar with concepts such as the title, author, and illustrator and justifying the reasons for their favourite book. ‘Travelling Ted’ and ‘Travelling Tina’ have been on many exciting adventures with their PP1 friends. 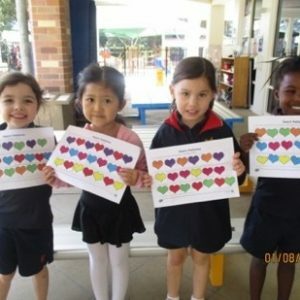 We have loved watching the girls present these to the class. ‘Travelling Ted and ‘Travelling Tina’ still have a few more friends to visit. 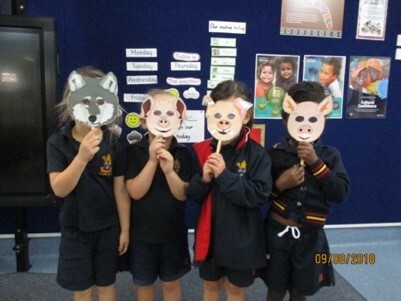 We have been focusing on retelling the story,’ The Three Little Pigs’. We have read several versions of the story and have contrasted and compared the similarities and differences. 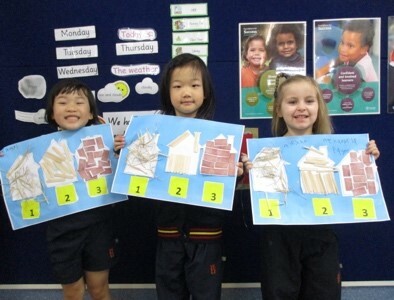 We have sequenced pictures of the story and partaken in art and numeracy activities based on the story. 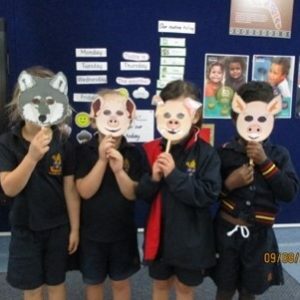 We have acted out the story using our own masks and props. We definitely have budding actresses in the class! Retelling the story has given us the opportunity to become familiar with recalling the characters and beginning, middle and end of a story. 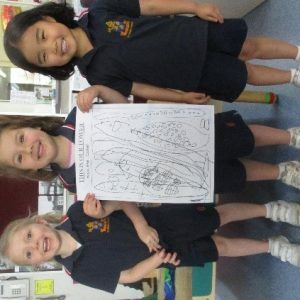 Retelling a story assists with the girls comprehension, vocabulary and their receptive and expressive language. 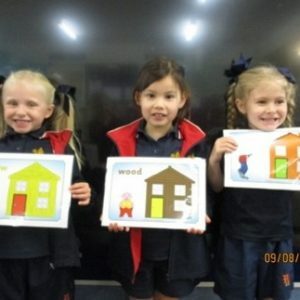 The girls have shown a large interest in birds and have been regularly pointing out different types of birds that they find at Pre-Prep and in the wider school community. The girls’ interest is highly evident on our nature walks as they spot, name and shout excitedly when they see a bird. 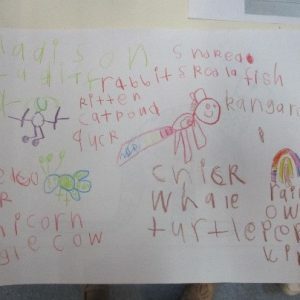 There have been birds we have seen and not known what species they are. 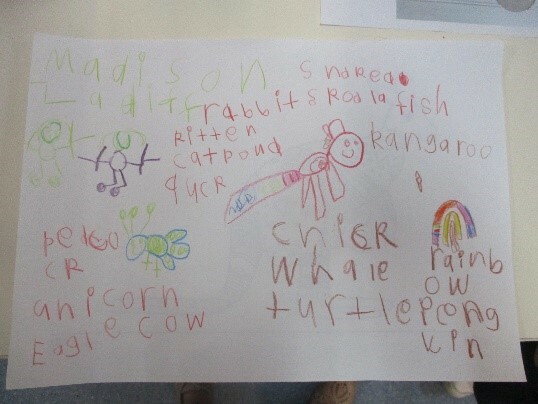 The girls were particularly curious about the blue-faced honeyeater and we had to research to find out what it was. They also love the ibis who visit us daily. To extend on this we will be learning further about the birds in our environment and more broadly about Australian birdlife. In addition, we are striving to educate the girls about the importance of caring for our wildlife and the environment, and have been looking at the impact we as humans have with a focus on pollution. I cannot wait to see where this project takes us. Please have a read of our bird diary or take time to view the bird display in our classroom. 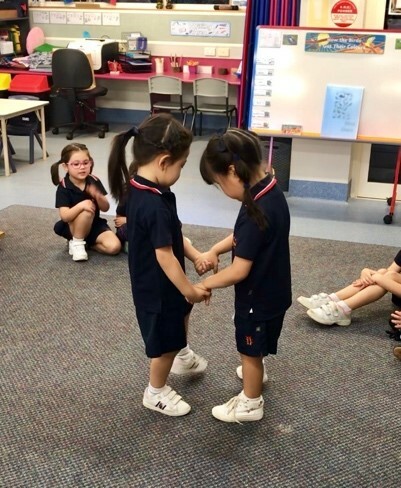 We have been learning some dances recently that involve partner work. 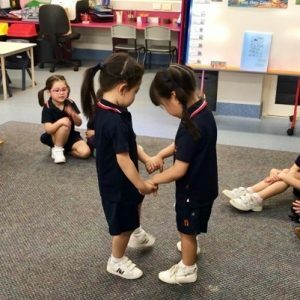 This social activity helps the girls improve their coordination and social skills, and enables them to communicate better, learn teamwork, develop a greater sense of trust and cooperation and learn body awareness. It is also loads of fun and great exercise. 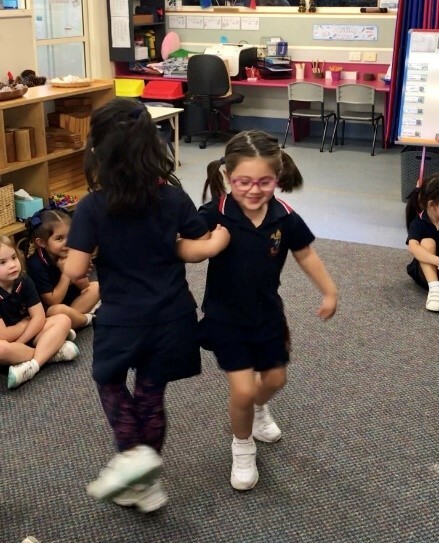 The ‘Heel & Toe Polka’ has been popular along with ‘Jump, Jump, Star’. 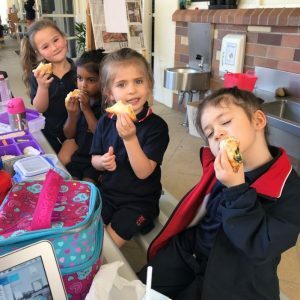 We have engaged in various cooking experiences this term. We harvested fresh spinach from our garden, and made spinach and fetta pastries. We have also made sandwiches and cupcakes. 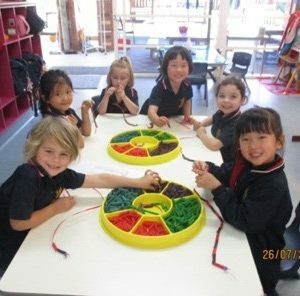 These experiences enable the girls to engage in and contribute to shared learning whilst further developing their numeracy and motor skills as they manipulate equipment, measure ingredients and manage tools with increasing confidence. The girls have gathered quite a collection of items from nature on our found shelf and have been wonderful at recycling, so we decided to use these items in a diorama style project. 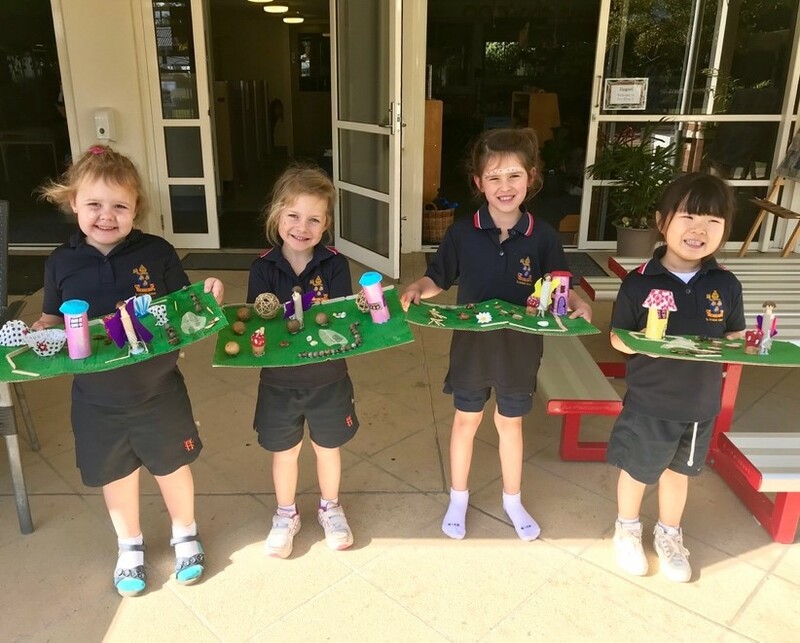 With their interest in fairies continuing, the girls each had the opportunity to make a fairy world using found and recycled resources. This project took the girls a couple of weeks to complete and the results were gorgeous and unique. 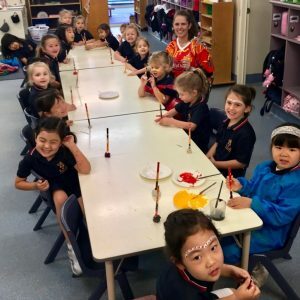 This term we have continued learning about and celebrating Aboriginal People and Culture. 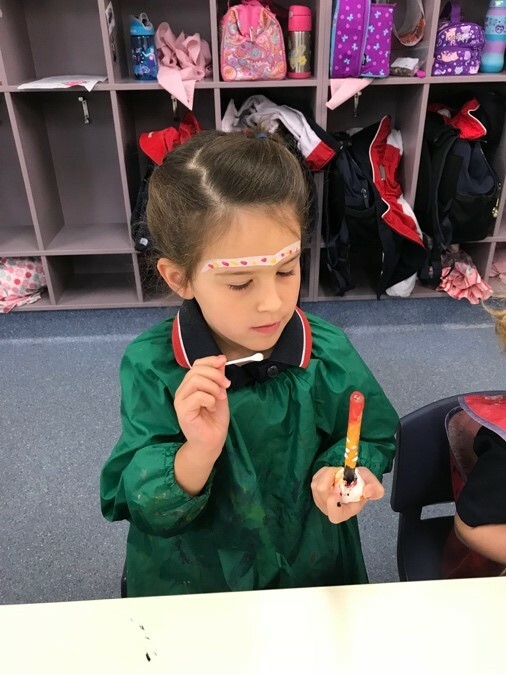 We have been exploring various dreamtime stories such as ‘How the Birds Got Their Colours’ and ‘Why the Emu Can’t Fly’, which have linked in beautifully with our Australian birdlife learning. Story telling is such a important part of Aboriginal and Torres Strait Islander people’s culture as it explains the creation of all things, why things happen, where to go and not to go, how to find food, cultural practices, laws, history, family, tribal boundaries and the relationships with every living creature and feature of land, sea and air. 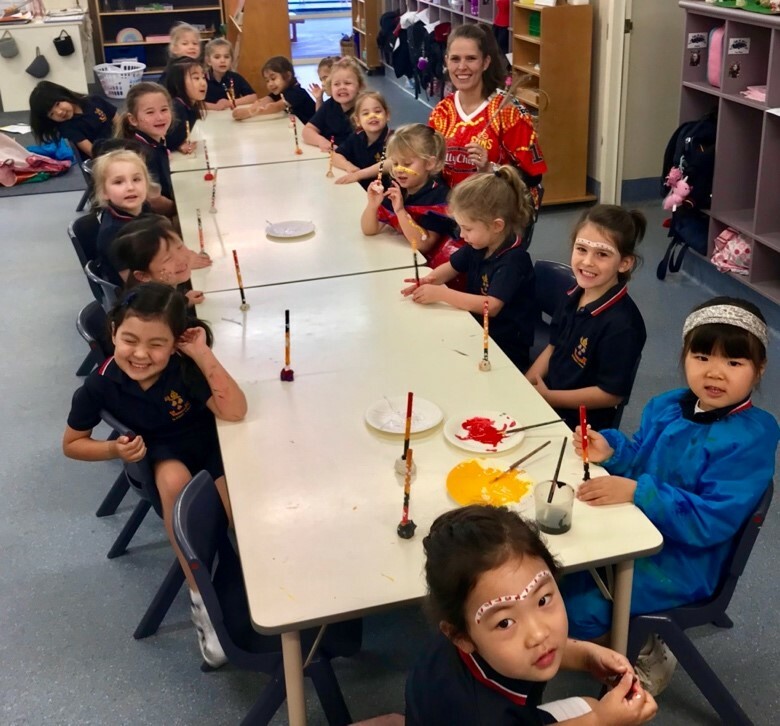 Recently, we were lucky enough to have one of our Mothers, Ms Hodge, who is a Bigambul woman, come in and run a workshop as part of our Aboriginal and Torres Strait Islander Children’s Day celebrations. 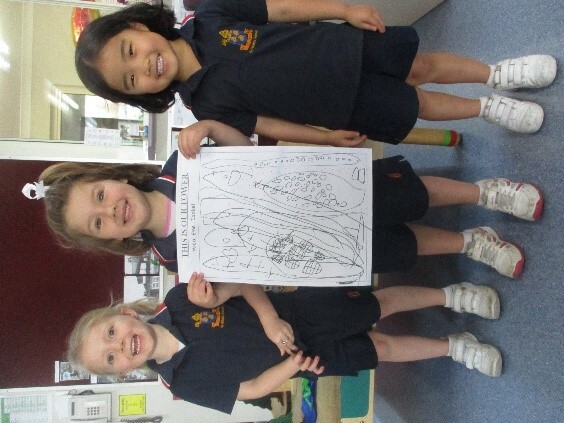 We learnt that the Yugambeh Nation has three totems the Buneen – Echidna, Borobi – Koala and Chungarra – Pelican. 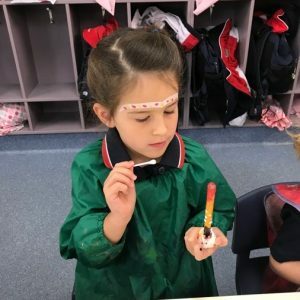 The girls engaged in an Emu Totem art experience, had their face painted and listened to a dreamtime story. Thank you Ms Hodge for sharing your culture and enriching the program in such a meaningful and authentic way. 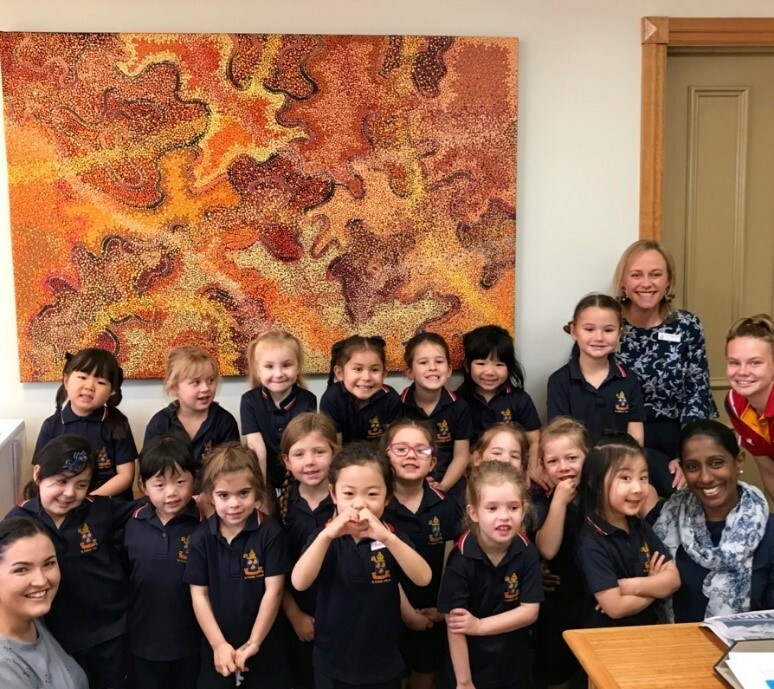 In addition, the girls enjoyed a visit to Dr Wilson Reynold’s office to view a large piece of Aboriginal art and learn the story of the piece. 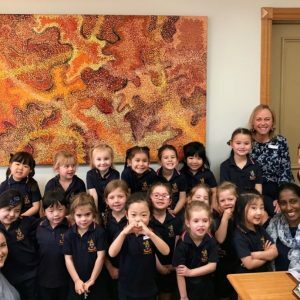 We have been lucky enough to view various pieces of Aboriginal art this year and the girls have been highly interested and inspired by the work of various artists such a Dean Rotumah. Welcome back to Term 3. It has been wonderful to see the girls return to school happy and full of energy. 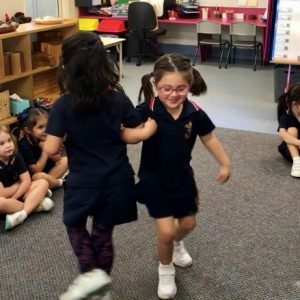 This term we will be providing a program that encourages and promotes perseverance and self-confidence, confidence to share feelings and ideas, to make good choices during play and to try new and challenging tasks. These outcomes will help the girls develop their self-esteem and to become resilient little people. We will be continuing to promote respect for the environment by learning about reducing, reusing and recycling, and we will also be following their understandings about the interrelationships between people, land, plants and animals. They have loved caring for our worm farm and are learning how to separate their rubbish at meal times into different bins – waste, recyclables and food scraps. Thank you to those families buying our ‘worm juice’ and bringing in scraps for our compost bin. 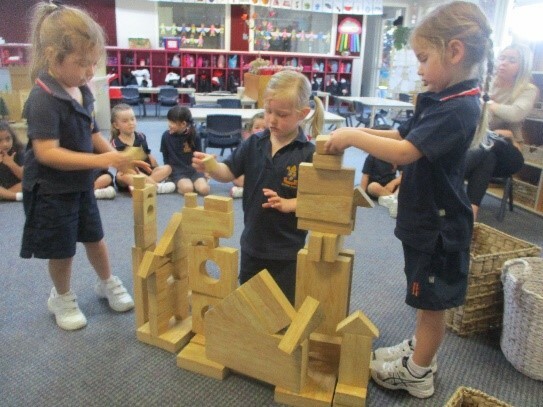 The girls have been learning about teamwork and good sportsmanship while continuing their investigations into ‘Towers’. They worked in groups of 3 to build the highest towers they could in just 5 minutes, then used their observational drawing skills to represent their buildings. They had lots of fun and there was a lot of cheering and clapping to support each team. We are continuing to explore sound/letter relationships through rhymes, storytelling, silly songs and games with lots of girls exploring reading and writing behaviours such as writing words, reading stories and making cards for their friends. What a fabulous start to the term!